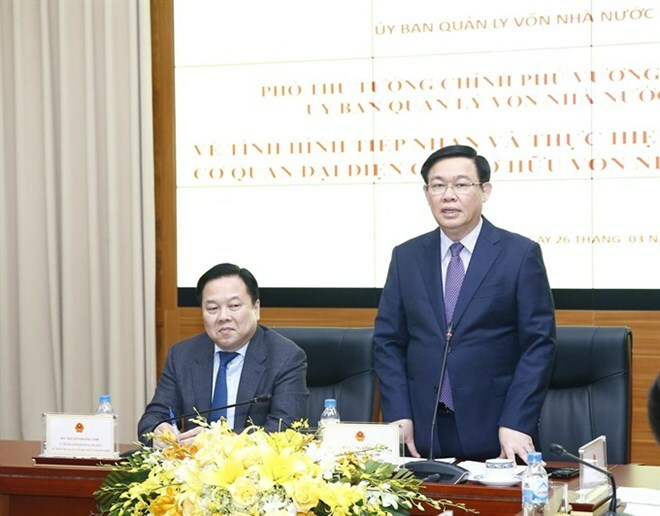 Hanoi (VNA) - The function of the Committee for the Management of State Capital at Enterprises (CMSC) is not trading State capital but to organise and develop State capital, said Deputy Prime Minister Vuong Dinh Hue. Hue made the statement at a working session with the CMSC in Hanoi on March 26. This was the first official meeting between the CMSC with a government leader since the committee was established in September 2018, with the aim of improving the efficiency of the use of State capital to enhance the competitiveness of the whole economy. It has one chairperson and at the most four vice chairpersons appointed by the Prime Minister. Attending the meeting were also leaders of ministries, branches and officials of the committee. Hue, who is also head of the Steering Committee for Innovation and the Development of Businesses, said that there are many difficulties in the committee’s operation and in State capital management. He asked ministries, agencies and committees to identify the remaining obstacles and requirements to resolve them quickly. Agencies should also cooperate to solve problems arising in management and administration, such as organisation, personnel, assets and capital issues, he said. Deputy Chairman of the CMSC Ho Sy Hung said the problems that the committee is facing included authorization to make investment decision, public investment, regulations on the management of transport infrastructure, real estate restructuring, valuation of intangible assets of enterprises and inspection and supervision of enterprises. In the short term, Hue said the CMSC should focus on dealing with 12 loss-making projects under the management of the Ministry of Industry and Trade, and approving the production and business plans of 19 State-owned economic groups and corporations put under the management of the committee, with a focus on comprehensive restructuring of finance, personnel and investment. SOEs should put an emphasis on key areas such as national defense, security and essential areas that private sectors were not involved in, and divest capital from other areas in which SOEs were performing effectively, Hue said. The Deputy PM also asked ministries and agencies to cooperate with the committee to fulfill the common goal of organising and developing State capital in enterprises. According to the 2018 decree guiding its establishment, the committee is responsible for managing State capital in enterprises where the State holds a 100 per cent stake and in joint stock companies and limited liability companies with multiple members in which the State has invested capital. The CMSC currently manages 19 State-owned economic groups and corporations. According to consolidated financial statements by December 31, 2017, the total value of State equity in these 19 groups and corporations reached more than 1 quadrillion VND (43 billion USD) and the total value of assets was 3 quadrillion VND. The aforementioned 19 enterprises are run by five ministries. Topping the list is the State Capital Investment Corporation (SCIC) under the management of the Ministry of Finance. The remaining 18 SOEs are managed by the Ministries of Industry and Trade (MoIT), Transport (MoT), Agriculture and Rural Development (MARD), and Information and Communications (MIC).